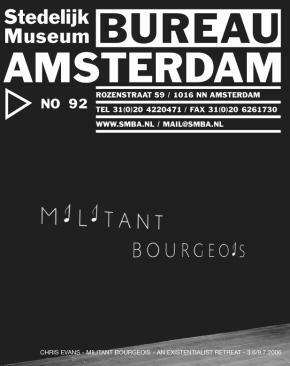 Militant Bourgeois is a residency scheme for Dutch artists initiated by Chris Evans, a British artist who recently spent a year working in Amsterdam. Not much is on offer: the livework space is a Portakabin beneath a busy fly-over on the outskirts of the city and applicants should note there is no stipend. On the surface, it is difficult to see why anyone would want to apply. Unfortunately, the general perception is that the Netherlands has not received an exceptional artistic return for this exceptionally generous investment. Though it undoubtedly has its share of good artists, the Netherlands lacks the dynamism of Berlin, London or New York, for example, where artists are usually left to fend for themselves. 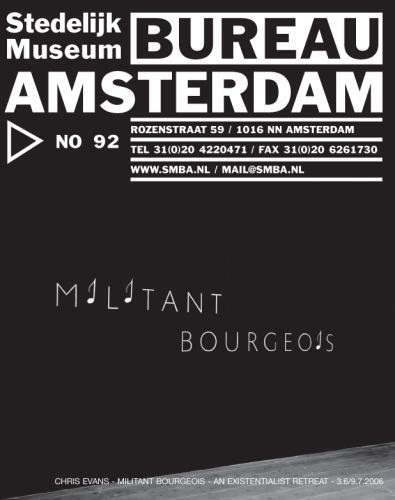 In Militant Bourgeois, Evans has sought explanations for this paradoxical state of affairs in Existential philosophy on the one hand and Dutch history on the other, particularly Amsterdam’s ‘Golden Age’ when Rembrandt and his contemporaries found patrons amongst the newly rich merchants presiding over what was then the financial centre of the world. Militant Bourgeois is a social experiment devised to determine, or at least speculate on, the extent to which the emergence of great art is dependent on patronage. Authentic man, according to Jean-Paul Sartre, is he or she who, having confronted the meaningless of the universe, accepts responsibility for his or her actions. With no God there is no a priori worldview to inherit since that would require some sort of metaphysical guarantee. Instead, in Sartre’s words, ‘man must make man’, inventing his or her own moral values through his or her own decisions and actions, a process he regards as being analogical to artistic creation.4 In the absence of ethical hand-me-downs ‘man is condemned to be free’, by which he means that the individual’s freedom to choose is a consequence of being ‘abandoned’ or ‘forsaken’ in a world without meaning.5 With that freedom of will comes responsibility for one’s actions. Anxiety, or angst, a condition commonly associated with a life lived Existentially, tends to be a consequence of these responsibilities. Militant Bourgeois proposes to condemn Dutch artists to this freedom by temporarily severing them from both state support and everyday comforts and distractions. Forsaken in this way, Militant Bourgeois aims to facilitate a confrontation with the truth of the human condition, an experience that may lead artists to the wellspring of great art, as it did for the ‘lonely’ and bankrupt Rembrandt late in life once he had lost his wife, his children and mistress and most sources of patronage. Conditions at Evans’ retreat are indeed bleak. Participating artists will be accommodated on unwanted land beneath Amsterdam’s busy orbital motorway, like 21st Century lepers driven out of the city walls or the protagonist of J.G.Ballard’s Concrete Island who is forced into exile from the modern world. Only someone sharing Ballard’s dystopian sensibility would find romance amongst the serried ranks of concrete columns that support the roaring traffic overhead. The interior of the retreat is as barren as the view outside. The Portakabin’s only furnishings are a plain table and chair and a wood burning stove whose elaborate chimney is its only distinctive feature. The latter’s complicated flue has an arborescent form, its ‘branches’ resembling eleven ladders, each penetrating the roof of the dwelling. Hardly ergonomic, viewers are drawn to allegorical explanations for its unusual form. The design of the chimney is the outcome of a collaboration with Baron Jan Six, the director of the world famous Six art collection, whose 17th Century namesake was the subject and commissioner of one of Rembrandt’s most celebrated paintings, Portrait of Jan Six (1654). Evans asked Six to envisage a sculptural appendage for the retreat’s stove that would represent his understanding of the Existentialist experience. The symbolism of the image Six eventually settled on is multiple: it alludes to the endless choices with which we are confronted on the ‘ladder of life’, the eleven generations that separate the current Six generation from the Jan Six of Rembrandt’s painting, and the audacious ladder-like strokes of yellow paint with which Rembrandt represented the golden brocade running the length of his subject’s red coat. The film accompanying Militant Bourgeois features the two Jan Sixes united across an interval of generations. It begins with an introduction by the urbane Baron, seen sitting in an upmarket Amsterdam café, in which he recounts the process of his collaboration with Evans. At the end of his speech the scene dissolves like a dream and the next thing we know we’re in Six’s residence, exploring its baroque interior, the same interior that Rembrandt’s Jan Six once occupied, in which his priceless portraits still hangs. This time the narration is spoken by an unseen and unidentified male voice seeking to enter the mind of the wealthy poet, avid collector and sometime Burgomaster of Amsterdam across a distance of 352 years at the precise moment represented in the painting. As the narrator gets into his stride, the voiceover evokes a cross between the inner world of a central protagonist in an existential novel and a piece of mid 20th Century, Existentialistinspired criticism. The painting is a gift for the Existentialist interpreter: the opaque darkness from which Jan Six emerges, together with his action of pulling on his gloves, suggests he is on the threshold of home and street, his private and public lives, his psychic world and the material world. Simon Schama claims it is ‘the most psychologically penetrating of all Seventeenth Century portraits’.6 The video’s narrator imagines the thirty-six year old ‘gracious dilettante’ momentarily dreaming of renouncing the trappings of wealth and power to follow a life of artistic endeavor, like the ‘notoriously difficult’ painter he patronises.7 But by the end of the narration we find him unable to make that sacrifice, preferring instead the comforts and distractions that derive from privilege. The reverie over, the scene cuts back to Jan Six the younger seated alone in the café8. In Militant Bourgeois Evans turns the tables on the usual relationship between artist and patron. Here it is the artist who commissions a sculpture from the private patron, Evans seemingly adopting the artistically subservient role of facilitator and fabricator, at the same time as also adopting the role of the public institution through his artist-in-residency scheme. As in his other projects Evans delegates responsibility for making the works of art to others, in this instance, Dutch artists and a wealthy aristocrat. In Radical Loyalty, for example, directors of multinational corporations with major investments in Estonia were commissioned to come up with designs for sculptures that would represent their interpretations of the oxymoronic value expressed in the project’s title. The full-scale sculptures, destined for a plot of land Evans has bought in an industrial town in the centre of the country are to be realised by artists who used to make their living creating statues of Soviet leaders in Communist times. For The Rock and the Judge policemen were asked to make a drawing of a judge who had made a significant impression on them. In response to each drawing, Evans made a sculpture of a rock to be positioned in front of the original drawing, taking on the role of imagined defendant. The collaboration with Six and the existential retreat, on the surface, seems to be a means to an end, that end being the production of a sculpture (the wood-burning stove) and whatever art works are produced as a consequence of the residency. Instead the opposite is the case: it is not the drawings and sculptures themselves that have the status of artwork, it is the relationships that arise from their production. Things easily identified as art in Evans’ projects are like flies trapped in a spider’s web: it is the web we should be looking at. That web represents the contradictory but codependent forms of wealth, power and ideology (hereditary, corporate, administrative and intellectual) that determine everything in society, not least art and its institutions, despite the common pretense that art is outside or above such things. Chris Evans’ Militant Bourgeois is no self-determined Existential hero. Any artist taking up Evans’ offer of an Existential retreat would be participating in another artist’s project, a project that pretends to be an autonomous agency, but which forms part of an exhibition made possible by a genuine state-funded institution. 1 Jean-Paul Sartre, ‘Existentialism is a Humanism’ (1946) in Existentialism from Dostoyevsky to Sartre, edited by Walter Kaufman, Meridian Publishing Group, 1989. 2 Clement Greenberg, ‘Avant-Garde and Kitsch’ (1939) in Art and Culture, Thames and Hudson Ltd, 1973. 8 Chris Evans commissioned the philosopher Nina Power to write the Existentialist narrative, which was then developed into a film script in collaboration with the writer Will Bradley. N.B. The retreat is expected to be realised by mid-September 2006.